Nancy was born to John Denton and Mary Ethel Floyd in Ada, OK on Dec. 1, 1939. Nancy and her older sister Mary Virgina grew up in Ada where both attended East Central University where their father taught industrial arts. Nancy graduated in 1960 with a Physical Education degree and began her career as a physical education teacher at Monroney Junior High School in Midwest City, OK. At Monroney, she met and subsequently married her husband, George Ivie in 1961. The couple had three children- Jimmy and twins Sherrie and Kerrie. During her 12 years as a stay-at-home mom, she remained busy as a PTA officer, homeroom mother, Girl Scout leader, track coach, numerous home economic activities and sport’s fan/supporter. Subsequently, she returned as a PE teacher at Nicoma Park Elementary where she worked for 22 years retiring in 1997. While in Midwest City, she was a member of Wickline United Methodist Church, Oklahoma Home and Community Education group, Oklahoma City Travel Club and Lexi Court Homeowners Association. 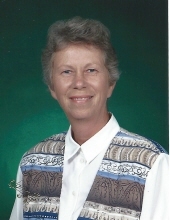 In retirement, she cared for her husband until he passed in 2011; but remained active in many volunteer activities and went on many trips with the travel club. All of her children graduated college and she has five grandchildren, Blake Hartzell, Haley Hartzell-Jones, Bailey Autrey-Mason, Anna Wang and Jacques Wang; and one great grandchild, Hazell Jones. We will miss Nancy but know she is in a better place with her husband of almost 50 years, George. God Bless, Nancy Ivie. In lieu of flowers, family has requested donations be made to Wickline UMC Whiz Kids, Wow Kids, and Club 52. A memorial service to celebrate Nancy’s life will be 11:00 AM, Wednesday, December 5, 2018 at Wickline United Methodist Church in Midwest City. To send flowers or a remembrance gift to the family of Nancy Ivie, please visit our Tribute Store. "Email Address" would like to share the life celebration of Nancy Ivie. Click on the "link" to go to share a favorite memory or leave a condolence message for the family.